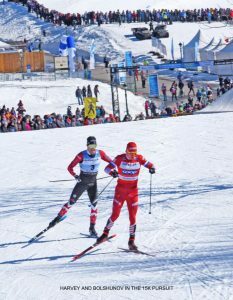 After I retired from the electronics company, I had the opportunity to see a number of XC World Championships and World Cup races, but until last weekend it had been quite a while since I had seen the last one. When my wife Anita found out the last World Cup of the 2018/2019 season was in Quebec, she insisted we go. She thought I was reluctant and said. My relationship with Pierre began in 1990. He called and said he wanted some V2 roller skis. He also told me that he and Pierre Laflamme had started a business venture, building LAFLECHE ski poles and bicycles. Pierre wanted to know if I was willing to help them if they had any technical questions. Shortly after Pierre called there was a sporting goods show in Montreal and we decided to run a booth. LAFLECHE was also going to be there and Pierre said he would meet us at the unloading dock. Harvey arrived from Quebec City just as we arrived from New Hampshire. There were about twenty-five vans and cars in front of us waiting in line to unload the gear for the exhibition. When the security person walked up to Pierre’s vehicle, he immediately recognized Harvey and told Pierre to follow him. Harvey and our V2 mini-van followed the security guard to the front of the line and we unloaded our gear. I knew Pierre was a legend in Quebec, but I had no idea he was that famous. (In 1984 Pierre competed as a cyclist in the summer Olympics and as a XC skier in the winter Olympics. He has won both the 50K Holmenkollen and the Norwegian Birkebeiner and has three 1st places on the World Cup Circuit.) At the show we met Harvey’s partner Pierre Laflamme and his wife. For the next two days of the 1990 trip we all had dinner together and enjoyed some fantastic Montreal food. Anita and I arrived in Quebec on Friday, 3/22/19, early enough to see the sprint finals. There were no real surprises as sprint leaders Johannes Klaebo and Stina Nilsson both won. In the ladies 10K I just assumed Therese Johaug would win. Had a perfect spot to take photos, as I was standing next to the professional photographers at the top of the last hill before the downhill run to the finish. When I looked down the hill I saw Johaug in front of Oestberg and a Swedish uniform right behind them. Could not see who it was until about ten seconds later. It was Nilsson. 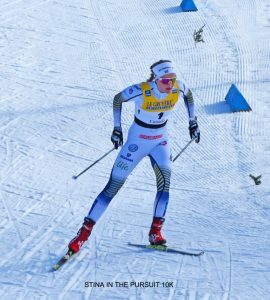 Johaug and Oestberg were not able to pull away from her. Stina has had a couple of good 10K’s, but just assumed Therese would go so hard on the climbs Stina would not be able to hang on. But she did all the way to the top of the hill and with her sprint speed I knew she had a very good chance of winning. She won and this was the first distance race all season that Johaug has not won. At the end of the men’s mass start 15K there was a group of five at the top of the hill. Alex Harvey had a super race finishing 2nd just behind Klaebo. Had expected Bolshunov to do better in the 15K but it was not until Sunday I found out he broke a pole. That is exactly what happened. About twenty meters before the top of the last hill, where I was taking photos, Johannes sprinted by them. Bolshunov and Harvey chased Klaebo, but you could tell from the top of the hill that Klaebo would win. This was Quebec and everyone was shouting for Harvey and he passed Bolshunov and got another 2nd. 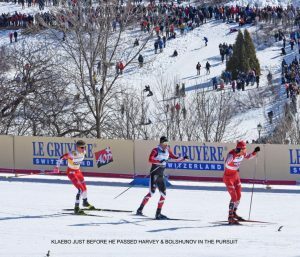 A fantastic weekend for Alex Harvey and the local TV and Press media had Alex prominently featured. In the ladies pursuit Stina Nilsson started 34 seconds in front of Inguild Oestberg and 49 seconds in front of Therese Johaug. Johaug caught Oestberg fairly early then they chased Nilsson together. Stina was cool and with 2K to go she was still 18 seconds in front. and When she passed by our photo spot she had a lead of about 12 seconds. Klaebo won all races, as did Nilsson. Very seldom in a mini tour that someone wins both the sprint and distance races. It was a great weekend and here are some pictures.